Literally defining the title of her hit song "Superwoman", vocal R&B veteran Karyn White embarks upon a fresh phase in her remarkable career. What appeared to be a 17 year hiatus proves to have been a period of foundation building for a series of lucrative sidelines - including businesses, investments and cyber/digital entertainment ventures to name a few. 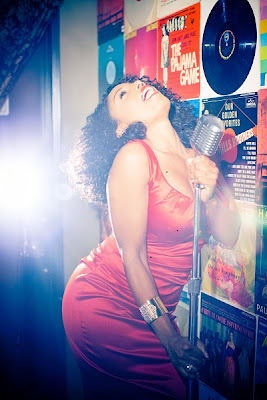 Returning to shine in the industry spotlight, Karyn White is busier than ever with an in-development reality show; a seven episode sitcom pilot scheduled for release this fall; and an album release entitled "Carpe Diem" - on her own "KWE" record label (distributed thru Lightyear/EMI in the U.S.) Her soon-to-be released single, "My Heart Cries", is headed to radio listeners in the coming weeks; while she maneuvers licensing deals in Japan, Scandinavia, Poland, Russia, and South Africa. Topping off her current projects is a book of positive affirmations also on the market. Inspired by the response from fans over her return to main stage; her album, "Carpe Diem" - Latin for 'seize the day' - has become the catalyst for doing just that, with a planned tour throughout the country. Initiated in March of 2012, Ms. White tested the waters with four shows done over a three day period at the Rrazz Room in San Francisco's famed Niko Hotel. The intimacy and interaction with the crowd convinced the two times Grammy nominee of what type of arena would best host her, and exampled the ideal atmosphere that would allow her to tour with her soulful performances. A keen business woman with a sharp eye on professionalism and the best possible presentation for her audiences; Ms. White is firmly at the helm this go round and fully her own boss - having learned much from her years building enterprises and expanding her talents into other genres. Her business acumen is at the base of all she undertakes, including the current tour. Giving the songstress a chance to be up-close and personal with her audience promises to offer, those who have long loved that distinctive voice and her seemingly ageless appeal, a tour as memorable as her musical legacy. Says White: "I am excited! We are scheduling the tour to start the first weekend of July and I want to be on the road every weekend after that." As plans for the cities and dates are finalized in the coming weeks, the other endeavors surrounding what is the new branding of Karyn White, are set to hit audiences back to back between summer and fall, building up to a wonderful start for a superwoman.